I walked through West Elm last night on my way home from work and I really liked what I saw. My favorite piece was the $300 vanity, which makes my cheap-o Target vanity from their shabby chic line look, well, shabby. I love the lines, the storage space and the ability to hide your makeup away under the fold down mirror. I am a firm believe in having a vanity, as storing makeup in the bathroom leads to increased bacterial growth and shorter life span of products (due to the humidity from those long steamy showers). That vanity is gorgeous! We don't have a West Elm in the town I live in, but we do have a Target, so I always end up with the cheap-o Target versions. We JUST got a West Elm. It nicer than Target, but still not quite as nice as I would really like. Its like the half way point between Target quality and Crate and Barrel, but probably closer in quality to CB than Target. Overall I like the minimalist vibe. And in terms of budget I'm probably somewhere between Target and CB (but ultimately a little closer to Target). 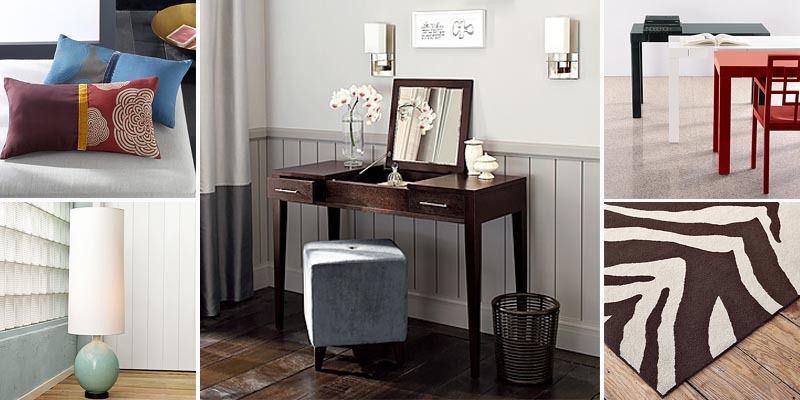 So, I'll be dreaming of a new vanity too, because I certainly cannot afford to buy one anytime soon! Thanks! I really love the zebra rug, but was unable to convince my husband. So, instead with have a simple black rug from anthropologie.